There is much that is troubling about George Osborne’s proposal to oblige future governments to run a budget surplus in normal times. There is the small matter of identifying “normal” times. It implies something important about how one is thinking about the macreconomy. What does “normal” look like? In the thirty years that I’ve been paying attention to the macroeconomy there always seems to have been some argument or other floating around as to why things weren’t quite normal just at the moment. This could drive us to the conclusion that the whole thing is a charade. It’s a policy that will never be implemented because there is so much wriggle room built in. A contrary conclusion might be that whatever macroeconomic behaviour we’re observing is normal, given an appropriate understanding of the macroeconomy. So it’s surpluses all the way. And then there is the small matter of who gets to define “normal”. It would appear that George Osborne would quite like to pass the responsibility to the OBR, who clearly aren’t all that keen to take it. A more significant reason to find the Osborne proposals troubling is the sense that they are all politics, no economics. They owe everything to Osborne’s desire to drive home the Conservatives’ political advantage on the economy. It is the next stage in the strategy of boxing Labour even further into a corner. It is clearly working, if Chuka Umunna’s comments in yesterday at the Independent are anything to go by. Leaving aside whether it is wise for Labour to conduct the economic debate on terrain marked out by Osborne the implication of this fiscal rule is an acceleration of the Conservatives’ ideological project of shrinking the state. But most troubling of all is the sheer economic illiteracy of the proposal. It finds few, if any, friends in the economics community. Yesterday’s Guardian carried a letter signed by 79 economists pointing out the potential problems that could follow in the wake of adopting the rule. Groups of economists write letters to the newspapers in a variety of circumstances. As Simon Wren-Lewis, who put his name to yesterday’s letter, points out, in the current instance we’re not dealing with a highly contentious issue. We’re dealing with relatively simple matters of arithmetic. Things have to add up. Your surplus is someone else’s deficit. If the public sector moves from deficit to surplus then someone somewhere is moving in the opposite direction. If it isn’t the corporate sector or the rest of the world – given the global economy is a closed system – then it has to be the household sector. And spiralling household debt is a less desirable foundation upon which to build an economy than modest public sector deficits. These are not really matters of high theory. Frances explained it at greater length a couple of months ago. In fact, if you look at the assumptions for reductions in the country’s external balance and increases in household debt that are required to get Osborne’s plan to a surplus in the timescale he’s promising the whole enterprise starts to look rather dubious. If we move on the issue of the hallowed debt-to-GDP ratio – which Osborne has elevated to the touchstone of economic competence, even while not actually reducing it himself – then things become a little trickier. The argument that you can reduce the debt-to-GDP ratio while running a deficit, as long as GDP is growing at a faster rate than the deficit, is less intuitive and a little harder to grasp. And the idea that you can by the very decision to incur a deficit – if spent wisely – raise the rate of GDP growth itself is a step further. This is where economists point out that the macroeconomy is not like the household economy. And therefore this is where macroeconomics starts to depart from “common sense” understandings of the way the economy works. One of the reasons why Osborne’s agenda has been so successful – and now Labour appear to be falling in to line with his narrative – is that it taps in to these common sense understandings. And because they are “common sense” they resonate with voters. Even if they are wrong. 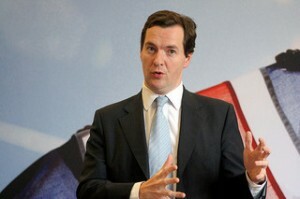 Who knows, maybe Osborne believes them himself, given he’s an historian by training rather than an economist. I’ve no idea how many of his advisors are economists. It seems to me that there is a bit of a Catch 22 here. Osborne’s rather suspect analysis is propagated by a sympathetic media and received positively by voters because many people lack the interest, inclination or analytical skills to seriously unpack what he’s saying. Opposition politicians feel obliged to debate on this terrain because to explain why Osborne is wrong and alternatives are not only possible but desirable requires a receptive, informed audience. Until people take a greater interest in the nuts and bolts of economic argument it is difficult to see how you break out of this cycle. I am reminded of a point that Ha-Joon Chang makes at the start of his book Economics: A user’s guide. He argues that it is every citizen’s duty to have some understanding of economics in order to be able to participate in democratic processes in an informed manner. In that respect it is good to see initiatives around citizen economics, often associated with organisations such as the Post-Crash Economics Society. There is much that can be done to raise awareness of the issues before you get to the stage of becoming embroiled in disputes between different schools of economic thought. I’d like to hope that at some point enough people are engaging with the arguments to generate sufficient demand from outside the political system for a more sophisticated public debate on the macroeconomy. But I’m not sure we’re quite at that point just yet. Policy unpacked #10 – Social housing: heading for history or the tenure of the future? I’ve said elsewhere that Keynesian economics used to be part of popular understanding – I think it can be again. However, there are strong forces pushing towards ignorance.